New York, present day, alternate reality. Karen Brown, angry and frightened after surviving a kidnap attempt, has a harsh choice – being eliminated by government enforcer Jeffery Renschman or fleeing to mysterious Roma Nova, her dead mother’s homeland in Europe. Alison Morton, a translator with an MA in history, has been a ‘Roman nut’ from age 11, but it was the mosaics at Ampurias, Spain that made her wonder what a Roman society run by women would be like in a modern age. 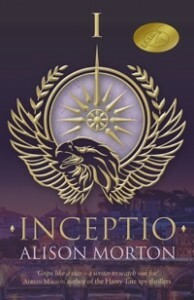 INCEPTIO is the result, the first in a series of Roma Nova thriller novels. If you’d like to buy a copy signed by the author, click here.